Anyone who has spent some time applying epoxies has come across this all toο familiar picture. Little pinholes in the floor. Repairing bubbles once cured is very difficult (or nearly impossible without needing to re-coat). Therefore the entire strategy for avoiding bubbles will need to fall on prevention of air bubbles. Over the years I have come to identify the key factors that can lead to the formations of bubbles in epoxy floors. Some of these I learnt the hard way, meaning that I encountered a cured floor with bubbles and needed to explain to the customer. And therefore I now make sure that most possible causes of bubbles have been eliminated before applying the epoxy coating. This is probably one of the largest causes of bubbles. No two concrete slabs are the same and when applying high build coats it is absolutely crucial that the slab has been properly sealed with primer. If you find that the slab has absorbed the primer, always go for a second coat of primer or an intermediate base-coat just to ensure that the concrete has been properly sealed off. Porous slabs are tricky in the sense that some bubbles appear and you run the spiked roller over them to burst them. You leave the project site thinking that all air bubbles have burst, and about an hour they start to re-appear! At this stage it is impossible to go back and fix the problem since the coating is already curing. Therefore add an extra coat of primer as an insurance. This is much cheaper that having to re-coat a high build epoxy that could run your costs up significantly. This is a tip I only learnt recently after exchanging thoughts with some of my peers on Linkedin. Concrete slabs will change temperature throughout the day. In the early morning slabs tend to be more humid and cold. Later on in the day they warm up, the slab expands and moisture is released into the atmosphere. 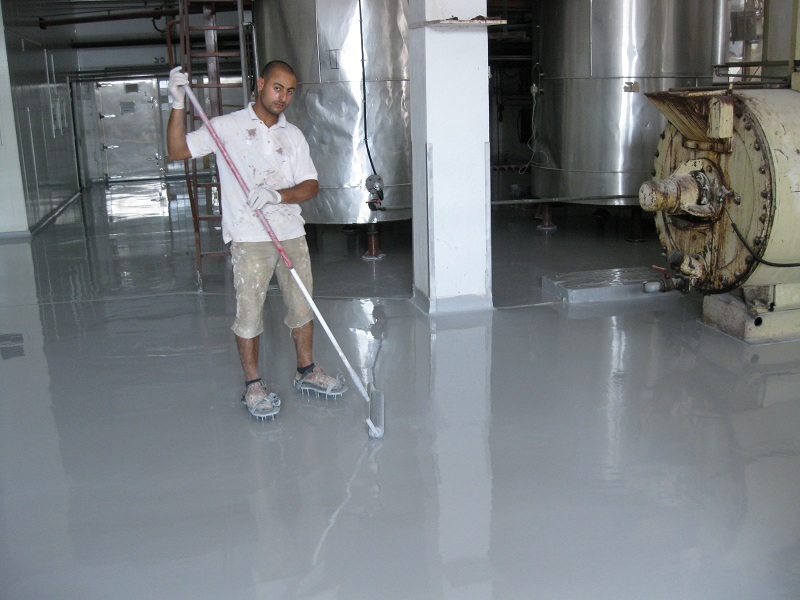 Therefore you should avoid avoid applying epoxies early in the morning as the slab will warm up throughout the day and that could lead to air being released and bubble formation. Apply around 12 noon, when the slab is already warmed up. When applying the coat, make sure that the entire surface has been rolled over and properly inspected for emerging bubbles. Also look out for edges and corners. 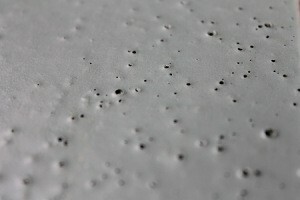 These areas tend to collect a lot of bubbles and they are not as visible when applying the coating. Shadows, object and reflections may obstruct your view. Good lighting is essential for avoiding bubbles. Some contractors like to add a thinner to the epoxy to enable the product to flow better (and also to get a few extra square metres per pack!). However solvents do evaporate from the screed and they leave little pinholes in their wake. Most of these bubbles will burst on their own but there will always be a few that will not. Therefore if you need to add a thinner keep it to an absolute minimum. There is a reason why high build epoxy coats are sold solvent-free. When mixing the two parts of an epoxy system some workers like to use a high powered mixer to get the mixing done quicker. High powered mixing though will lead to more bubbles emerging. Therefore use an adjustable speed mixer and mix at a low speed at around 300rpm. It is better to mix for two minutes at 300 rpm than 30 seconds at 1500 rpm. Tip: Let the product settle for a few minutes before pouring it on the floor. So now its your turn. What are your experiences with bubbles in epoxy floors? Have you identified any causes of bubbles that I have not listed above?